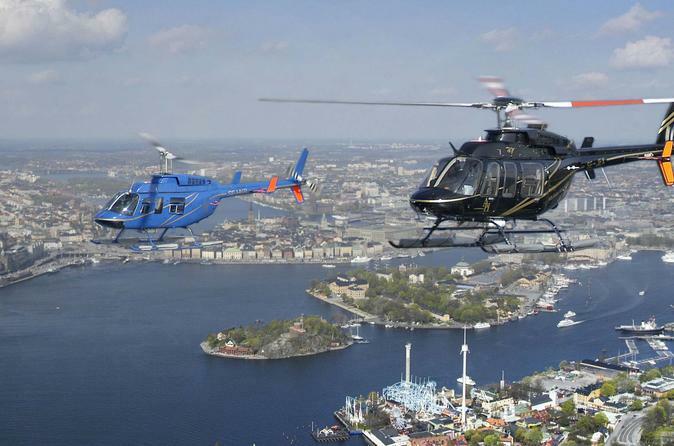 Fly in a helicopter over Stockholm, the archipelago and the Baltic sea during a 20 minutes comprehensive aerial tour. Pass over the city's canals, bridges and central islands while listening to informative commentary from your local guide and helicopter pilot. Hover for a closer look at landmarks like Kungliga Slottet (the Royal Palace) and Stadshuset (City Hall). Make your way to Gamla Stan, Stockholm's Old Town, to the landing pad and board your helicopter. Climb in to your seat, fasten your safety harness and take a look at the flight map as the helicopter ascends. Watch as the city falls out from below you while the helicopter rises. Appreciate the stately architecture and inky-blue waterways that wind through the city blocks as your guide and pilot points out Stockholm's landmarks and provides engaging commentary. Buzz over some of the city's most important sights, like Stadshuset (City Hall) and Kungliga Slottet (the Royal Palace). Be sure to bring your camera for spectacular aerial photo ops. After 10 minutes of sightseeing in the city, your pilot will head out over the Stockholm archipelago, a network of 24,000 rugged islands. As you fly, look for lighthouses, 19th-century fishing villages and harbors dotted with wooden fishing boats. At Vaxholm, a popular holiday spot for Stockholm city-dwellers, the pilot will turn back towards the city. Enjoy a final aerial glimpse of the city before landing back at your departure point. Please note: The helicopter seats a maximum of 5 passengers. Your flight may include other people, depending on your group size. The tour will take place if there are at least 2 participants during the week day (Monday to Friday) and if there are at least 4 participants during the weekend (Saturday and Sunday). In the of this minimum not being reached, you will be offered an alternative or full refund.